A Median Maiden Auction Stakes over 5f on standard going. A restricted race type where proven form gives greatest advantage. Seven two-year-olds take part, three colts against the fillies, the majority raced, although a gulf between the best and worst form. Finflash will take the world of beating here. This bay son of Jeremy was relatively fancied on debut at Ascot over 5f when just failing to collar Ifwecan who has franked the form since. This 20,000gns yearling was sent off favourite on his next start at Salisbury and perhaps - on the face of it - was slightly disappointing. However, it is more likely this youngster simply found himself in a pretty hot race. The winner of that contest, Saayerr, is unbeaten in two starts and heads to Royal Ascot, later this month. 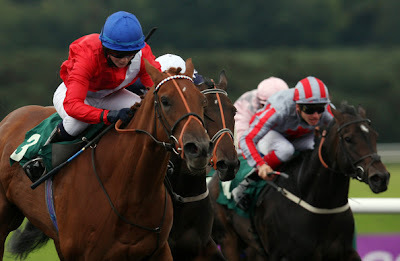 Finflash, trained by Mick Channon, will find this grade much easier and with valuable race experience should take this in his stride and go forward. A number of these have something to prove. Riley's Missile has ran six times and his last effort at plating class suggests that nursery races will see him in a better light. Flora Medici is a home bred who showed temperament on debut when running over 6f at Redcar. That was a fair maiden, but Sir Mark Prescott's filly showed only limited ability and is bred to need a test of stamina. This drop back to the minimum trip doesn't look a move in the right direction. One to take a watching brief unless significantly backed. Phil McEntee is a calculated trainer who often does well with his cheap purchases. Baytown Kestrel is a daughter of Captain Gerrard costing just £400 at the breeze-up sales, which is a give-away considering a couple of her siblings hit five figures. She is well drawn but not a debutante to bet today, although the stable can pull a surprise or two. Mick Channon fields a second runner - Ivan B - a home bred colt by Winker Watson out of a mare who showed little ability. A wide draw isn't a good starting point and the betting is the best guide to his chances. Very few of the stable's juveniles win when priced in double figures and unless the focus of a gamble best watched. As far as opposition goes, Weisse Girl & Vallila look the main dangers. The former, trained by Noel Quinlan, was well backed before the off when making her debut over course and distance. She played second fiddle to Smuggler's Gold who is a capable horse. The third horse, Kidmenot, has since won at Warwick, but needed the run first start, so it could pay to take that form line with a pinch of salt. Weisse Girl was made favourite at Catterick, looking to have a fine chance. Initially, finishing third looked something of a disappointment. However, the form of that race may be stronger than it looked with the winner Lorimer's Lot placed in the Hilary Needler. The second horse was priced very short for one of Michael Easterby's so time may tell the race had some substance. Not the easiest horse to assess but in a poor race she could have each way claims. Roger Charlton fields his first two-year-old runner of the season. Vallila is a French home bred daughter of Dunkerque, a sire who won at Group 3 class in his racing career. The mare was lightly raced and limited. The breeding doesn't give great confidence and home breds are often a little slow to come to hand. Certainly, it is never easy for a debutante to race on a turning track. The betting is the best guide to this February foal. However, with so few contenders in the field her odds could be shorter than greater even if limited. Still, the betting will be key. If priced 7/2 & less I would expect a bold show. If relatively fancied [13/2 & less] this bay has place claims. If weak in the market it would be a negative. Conclusion: Finflash went close to winning on debut and probably contested a strong race second start. He looks a cut above these and connections will be disappointed if this isn't third time lucky. Weisse Girl knows the lie of the land around here and will not lack for pace. Donohoe [jockey] may be instructed to press on and use that valuable experience. She ran well on debut although that second start is still a touch difficult to assess. However, in a poor-looking race I could see punters being tempted to take each way odds if the favourite is backed to huge odds on. Quinlan's filly has her work cut out against the favourite but it never pays to think any horse is unbeatable. The betting is the key to Vallila. Breeding doesn't inspire nor does a home bred on a turning track. I have a feeling she will be weak in the betting. However, if strongly fancied it would be significant. This is Finflash's race to lose. While Weisse Girl could be an each way punt but the favourite may need to disappoint.